encore Deals! | 60% Off One Month of Unlimited Yoga! 60% Off One Month of Unlimited Yoga! Expires 4/30/2014. One per person. One additional may be purchased as a gift. No cash value. ALL LEVELS are welcome to join us as we open Wilmington’s newest yoga studio! In Sanskrit, the ancient language of yoga, Kaya means “the physical body.” In Zulu, Kaya means “home” .In Rastafarian, “enlightenment.” These Translations are all examples of what we guide you towards, simply feeling the connection with your higher self, finding your bliss. 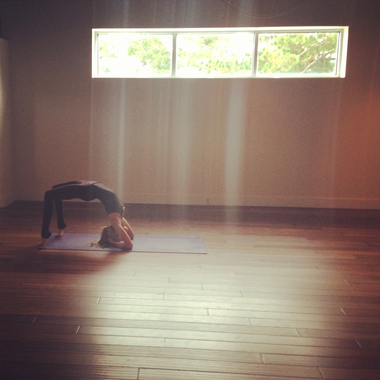 Kaya Studio offers Vinyasa/Power Yoga. Flow Increases internal Heat and Focus; it infuses the grace of movement with the strength of stillness. Vinyasa is flowing and moving with the breathe. We guide challenging yet uplifting classes where you are able to grow your practice as you feel or modify as you learn. You will build strength, balance, and flexibility while resting focus on the breath that allows space for your mind to become calm, focused, and centered. The deeper you breathe the more opens up.